You may have heard about preventive care but wonder what it really refers to. These are semi-annual visits to your local dentist for cleanings and checkups. The former removes harmful bacteria, plaque, tartar and any leftover food particles that can cause havoc for your oral health. Your examinations are used to identify any impending issues that need to be addressed before they mushroom into something greater. What are the Specific Benefits of These Visits? Cavities – The main nemesis of your oral health is the bacterium, and the first stage of the damage it causes is a cavity – a small hole created by the acids released from the bacteria that cling to your teeth from leftover food particles. Gum Disease – When cavities aren’t treated, they don’t just disappear. They continue boring deeper into your teeth and can eventually impact your gums. The first signs of gum disease are bleeding, pink, swollen or irritated soft tissue. Gum Recession – Another problem that preventive dentistry can offset is gum recession. This condition stems from prolonged negligence, which results in your gums shrinking and retreating from your teeth, leaving them susceptible to falling out. Does Preventive Care Save You Money? Another perk of visiting your dentist every six months is that you’ll save a ton of money. That’s because most insurance carriers will pay for up to 100 percent of your preventive care costs. 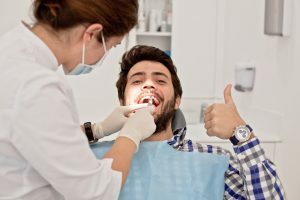 So not only will you be protecting your oral health, you’ll also prevent the higher out-of-pocket costs that come along with restorative care. These days, your schedule seems to be getting tighter and tighter. You’ll be happy to know, then, that by maintaining preventive are visits, you won’t have to make time provisions for special treatments to correct problems that could have been nipped in the bud early on. By making the effort to set aside just a few hours each year, you can save yourself the inconvenience of corrective procedures. It’s your right to have the absolute best oral health. To take advantage of the opportunity before you, just reach out to your local dentist to schedule an appointment today. Dr. Joe Isaacson earned his dental degree from the University of Oklahoma College of Dentistry and has gone on to have an award-winning career, which includes being rated #1 Dentist by Doctoroogle.com, “Best of OKC” and several other awards. He helps patients enjoy the peace-of-mind of having excellent oral health at his private practice and can be reached for more information through his website.